"No line that they lay could catch a shadow on the wall…"
is always good for economy, and for using icebreakers is next best thing! Cloak & Dagger besides this phrase being a staple of 1980's culture one of the most efficient anti-sentry combos out there. It's main limitation being where to get those credits from. One possibility? More Cloaks. Cloak & Switchblade the Criminal version of the combo above is even more efficient but utilizes credit even more inflexibly from Stealth cards. 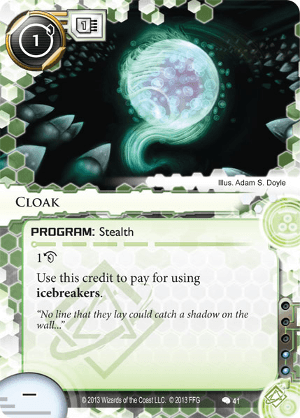 Cloak & Refractor is a decent anti-code-gate combo, there are other decoders that don't require the exclusive stealth , so Shapers are more likely to have this combo all to themselves. Excellent economy option, 1 install cost pays for itself on the first turn it's used. Freeing up for other uses. Stealth decks are most certainly going to auto-include Cloak, perhaps 2-3 of them. As a pure economic card it's not bad for many other decks, lots of flexibility particularly for Shapers means Cloak deserves a look.